Last November I bought some stamps on Royal Mail website so that I could send some of you Christmas postcards. I never thought anything of it until now when these booklets turned up in the post and weirdly I was quite excited about it. 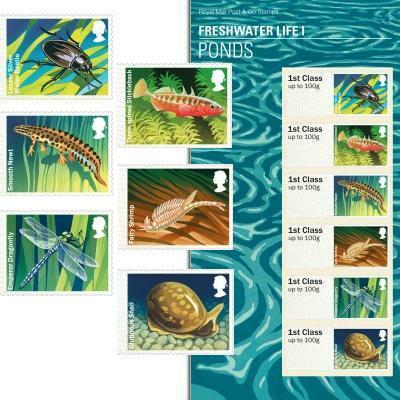 I love knowing what the latest stamps available are in the UK as I get so envious of other countries and what they have available. The thing is though if I'm sending letters in the UK I use 2nd class and they hardly make stamps in that amount. When I was in my teens they used to sell booklets of stamps with designs on but now its the typical queens heads. Lately though I've been tempted to buy a whole selection of 1st class stamps so that I can start weighing and mailing my own letters. Its something I haven't done for years as the postal prices started going up yearly and I couldn't keep up with it. Then came the point where we were introduced to the weight and size system so I couldn't be bothered even more in doing this. In reality that would have been a good point to start as I don't think even the post office workers know whats going on half the time. Also as I've mentioned quite often I'd love to decorate my envelopes when sending letters but I'm put off by those giant gold labels they print out on. When looking at photos of my mail that the recipient has taken it really makes me cringe but the worst for me was when I decorated the envelope and the postal worker stuck a sticker right on the main image of my envelope even though I'd left a space at the top right hand corner... I could have cried. Thankfully I'd photographed it so my partner knew what it look like. They just have no consideration for my designs but as I mentioned those labels are huge compared to the small ones in of other countries. 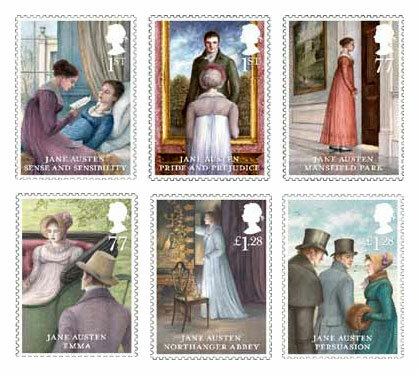 The other problem with these stamps is that the Jane Austen ones are sold as shown instead of a sheet/booklet separately which doesn't make sense as the 77p one would be great and then I can get a 10p sheet for making up the sum of postcard postage. I will need to get a move on and buy stamps because when I do get a house I won't be able to bulk buy so I might as well spend the money whilst I can. Its just a shame the royal mail website is the worst website I've ever had to navigate around, if you don't believe me just start looking for stamps to buy and you'll either take some time finding them or find them in a few different sections. It really makes my blood boil. Do you weigh and stamp your own letters? I know some of my friends will love these! I don`t weigh my letters and don`t buy any stamps because I really don`t understand how that thing works. I always get a different prices even for the 2 postcards sent to Europe. Sometimes I think they just steal my money, so I don`t send that much these days. I know they don't weigh my things properly as I've had 3 under paid postage items come back to me which always makes me wonder if they over charge me. I don't understand the weight and size thing but thankfully we have such big ranges for weight one one price that it should hopefully be easir. Thankfully with postcards to Europe and all other world zones is 87p but I have to try and keep it as flat as possible. Its a shame you don't have a broader price range also. 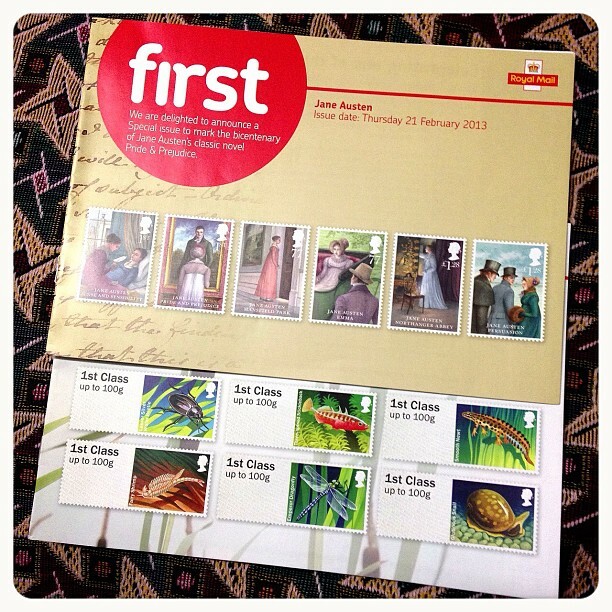 Thanks Tari :), I've purchased some stamps to start trying it out for smaller envelopes. I think I'll be ok as I did do it once but in order to make fun envelopes I need to get used to stamping myself :). I will look in to getting a scale myself as so far I've only purchased a weight/size template. why are all of your stamps sooo much cooler than canada's??? JEALOUS. I think we all feel like that about other countries stamps, I feel restricted though with most of them being in the 1st class range so you need a lot of stamps to make up international price ranges. Japanese stamps have to be the greatest though :). OMG OMG OMG OMG!!! Those Dr. Who ones are awesome! My friend sent me some Hobbit ones from New Zealand that I just got. Love them too. Also had this article sent to me today...I need to find someone who lives in Belgium!!! I will be ordering some as soon as they are listed as I know a few of my friends will like them. I've ordered a scale and a letter measuring gadget so I should hopefully do more of it myself now. I'm kind of excited about it and wish I'd done all of this earlier :). I've bought those fashion ones, comic and nature ones at the moment. Those chocolate ones are yummy. Canada Post has released the Chinese Zodiac Year of the Snake ones, so I'll try to make sure to use one on your letter this time.